Comida Loca is now Santa Fe Seasons! 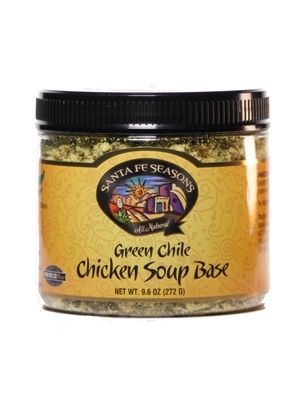 Santa Fe Seasons Green Chile Chicken Soup Base comes pre-blended with Green Chile which is grown on a family farm in the Hatch Valley of New Mexico. Use in soups and stews or add the delicious flavor of chicken soup and spicy green chile to beef or pork roast. Dissolve 1/2 cup green chile chicken soup base in 2 quarts warm water. Additional soup base can be added if a more intense flavor is desired. Bring above ingredient to a boil. Reduce heat and simmer for 1 hour. Garnish with 1/2 cup cheddar cheese. Chicken Soup Base, Dehydrated Green Chile, Onion and Garlic. Follow the recipe and it is great... add you own personal touches and it is fabulous... can not go wrong with this. very versatile, amazing flavor.